I should be thankful every day. But I'm not. That internal negativity sometimes wins the day. I blame my internal wiring. Thanks to all of my ancestors for my genetic code. See! I AM thankful. 1. I am thankful for my family. And occasionally, I think they are thankful for me. But this may be day-to-day. 2. I am thankful for my coworkers. I enjoy your friendship and working with you.... most of the time. 3. I am thankful for the banking industry. Most colleagues are cordial, humble, smart, and fun to be around. For the ones that don't fit this description, you know who you are. 4. I am thankful for regulators. They keep requiring bankers to hire consultants. 5. 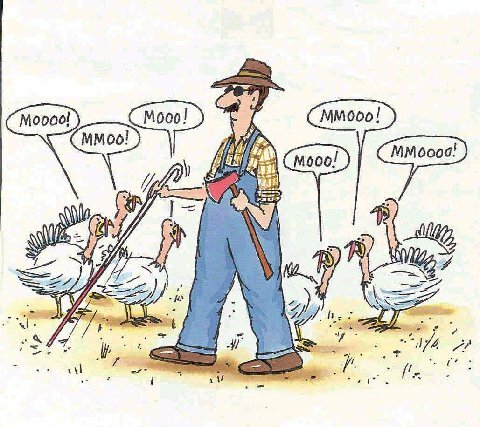 I am thankful I am not a turkey. 6. I am thankful somebody at our Thanksgiving Dinner understands the difference between a turnip and a rutabaga. 7. I am thankful for my LinkedIn connections, Facebook friends, and Twitter followers. Even that guy that keeps trying to make me an Internet millionaire. I know in his own way, he really cares about me. 8. 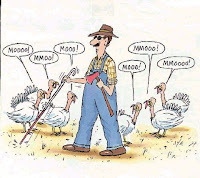 I am thankful I don't know what ROFL means. In this regard, ignorance is bliss. 10. I am thankful for my blog readers. Although after reading my 10 Thankful Things you may not be thankful for me. And I am thankful to be a dad of great daughters. And your mother gave you a better name than "anonymous".